Just for a change we spent 3 days last week travelling around Scotland with the Wee White Dug. Our adventures took us to Rob Roy country, Glencoe, Ardnamurchan and Mull. These are the highlights of our visit to Rob Roy country. We drove to Balquhidder Parish Church and parked in the small carpark there to begin our hike up into Kirkton Glen. The churchyard contains the grave of famous historical Scot, Robert Roy MacGregor or Rob Roy as he’s more commonly known. Jacobite and cattleman his gravesite is still a place of pilgrimage for many today, especially those sharing the name of MacGregor. Our walk took us up hill as many of our walks do. We’re suckers for a bit of elevation and a view. After a short while we came to an optional detour on the trail – Creag an Tuirc is the ancient rallying point of the Clan MacLaren. Creag an Tuirc translates from Gaelic as the crag of the wild boar. Thankfully we decided to check it out as it turned out to be the highlight of our hike. The views back down over Balquhidder and Loch Voil were stunning. We sat there for an age soaking up the scenery. The day was turning out to be a real cracker too. The rest of our walk into Kirkton Glen was less exciting, so after a couple of miles we decided to hike back to the car so we could find somewhere dug friendly for a leisurely lunch. We settled on the Four Seasons Hotel at nearby St Fillans for lunch. It’s located at a gorgeous spot on the banks of Loch Earn. It’s a dug friendly favourite of ours and the food and service are consistently good. Sitting there beside a Scottish loch, enjoying lunch on a perfect, sunny day it actually felt like we’d been transported to the Italian Lakes. Good food, sunshine and stunning scenery. There was even the sound of a jet ski buzzing away in the background. Not something you hear too frequently on Scottish lochs. After lunch we paid Rob Mulholland’s art installation ‘Still’ a visit. He stands shin deep in the loch staring, expressionless back towards the shore. He was glinting beautifully in the sunshine. The Wee White Dug was bothered not a jot by the big shiny giant in the water and paid him no heed whatsoever. Earlier in the week I’d read about the BLiSS Trail which is a trail of art installations and places to eat and drink in the region. I’d fancied checking out a few more of the installations. Rob Mulholland’s ‘Still’ is one of them. There was a colourful Heilan’ Coo on the trail in nearby Lochearnhead crying out for me to snap it. As I lifted Casper into the car I noticed them – tye critters from hell, ticks. There were two on his wee, pink tummy burrowing in for a feast. I always carry a variety of tick removing implements with me so thought I’d have them out in no time, and that’s when the almighty 10 round bout of Westie wrestling commenced. Once a terrier decides not to cooperate with you NOTHING will change their mind. We coaxed, pleaded, spoke sternly, attempted removal by stealth, surprise Ninja attack and when all else failed we pinned him down and struggled valiantly like bears. An hour later and two ticks removed, we were all exhausted. The temperature had risen to 24 degrees and after an hour of wrestling with the mini hell-hound I was hot, sweaty and dustier than Pig Pen from Peanuts. If truth be told I probably wasted more energy than was necessary stamping the critters angrily into oblivion under my heel once extracted. I didn’t have much enthusiasm for art installations after that mammoth wrestling session but I did still pay the coo at Lochearnhead a visit. ‘Bill the Bull’ by Kev Paxton is a lovely colourful piece. We’d definitely earned a wine and beer or two in the sunshine so we headed to our bed for the night in Balquhidder. We booked a very reasonably priced (£80) one night stay at the Mhor 84 Motel at Balquidder. The Motel is an eclectic mix of quirky, shabby chic decor, good food and live folk music. It’s extremely chilled and dug friendly too. We checked in, freshened up and headed downstairs to the beer garden for drinks. It was a gorgeous afternoon. The sun beat down on us, and as we enjoyed our drinks the stresses of city living and wrestling westies quickly slipped away. We ate our evening meal at the hotel and the food was excellent. Simple, unpretentious and wholesome. As luck would have it Thursday was “Thank Folk it’s Thursday” night so we enjoyed some wonderful Scottish folk music from a jam session of talented musicians. The wee dug snoozed on the bar floor, looking up only briefly when the sound of bagpipes caught his ear. He seemed to enjoy it as he listened intently for a while before slumping back down on the floor to snooze some more. Next morning before checking out we decided to have breakfast. Rooms at Mhor 84 are sold on a room only basis with breakfast being an optional extra. The coffee was good. The chilled orange juice tasted like it was made from actual oranges and it wasn’t served in the obligatory thimble sized, hotel breakfast glass. Hooray for a breakfast orange juice with more than 3 gulps in the glass. I had the ‘wee breakfast’ which came with good bacon, homemade bread, mushroom and tomato while Mr G opted for smoked salmon and scrambled eggs. He declared it the best he’d ever had. Until that morning the Bridgend Hotel on Islay held that esteemed accolade. It was very close apparently but Mhor 84 just pipped it. 3 days later he was still waxing lyrical. This is the man who remains unmoved at the sight of a Monet, Degas or Botticelli yet he has the ability to spout eloquently about a breakfast of fish and eggs! After breakfast we bundled into the car and set off for a weekend in Ardnamurchan via Glen Etive – some of you may know it from Skyfall. Well it’d be nuts to drive by and not recreate ‘that’ Bond scene so I’ll leave you with Bond and M.
The namesh Bond, Casper Bond. My boyfriend and I walked to Creag an Tuirc yesterday, following your recommendation, and the view is stunning! Definitely one of our favourite short walks now. Love following your adventures on Instagram and looking forward to reading about your time in Stirling, my adopted home. Fantastic photos as usual, glad you got thous tics of the wee white dug, they are nasty little blighters. Thank you – it was such a good trip and chilled too other than tickgate. I hate them. Evil little critters. 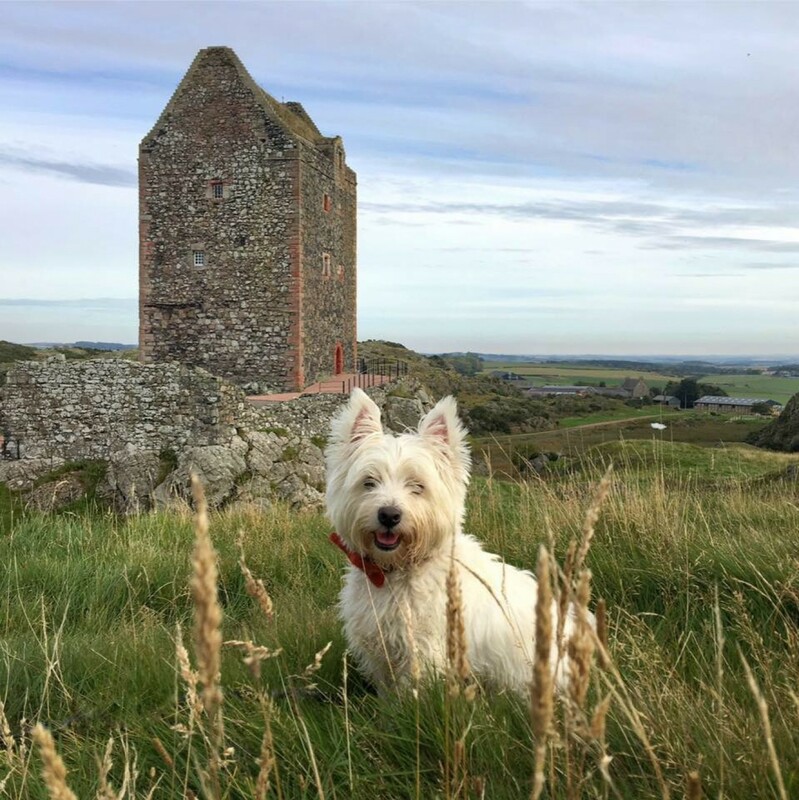 More places calling us for a visit after reading of your three-day adventure with the Wee White Dug. Thanks, y’all! As always I was mesmerized from beginning to end Thank you for sharing your adventures Your wee white dug makes me 😊.